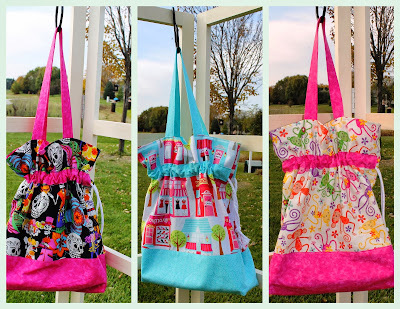 The featured Aerika Purse was originally made from fabric selvages and it is adorable. Even though I have enough selvage fabric to make one like the original, I chose to whip some up using some whimsical fabrics. The designer's pattern was easy to follow with nicely written step-by-step instructions. You can get the pattern download here. 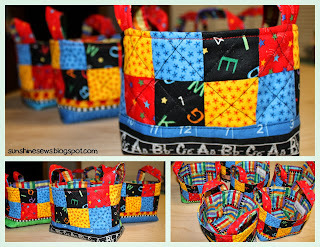 I was inspired by the lunch sacks made over at the inner child fun blog. That version was made out of recycled jean pants legs and had an apple stamp on the added pocket. My version uses the recycled jean pants legs for the bag too but I used the little pockets tucked inside the larger front pockets of the jeans and sewed them on the front of the bags instead. They are pretty small but oh so adorable. The tutorial for the original bag can be found here. Over the past few weeks we have been very busy with church, a rummage sale, my sister's surgical procedure and putting summer things away before winter comes. It's incredible how quickly the days go by. Unfortunately, it's not a good time for me to be away from sewing since the craft fair season is quickly approaching. With that in mind, I recently got my husband to make me a new display rack. The one I had was tall and heavy. It was pretty cumbersome for hauling and it barely fit into my SUV since it was so tall. Jeff made it from wood he had leftover in his wood shop. It was economical and very useful. Unfortunately it was so heavy I struggled getting it in and out of the truck. So I designed a new one. This one is shorter and made from a lighter wood. Instead of cutting 2x4s in half, this one used 1x2s that were made of clear aspen, a very pretty wood. So now it fits nicely in the SUV and I can lift it all with one hand. And it is very pretty. It folds up nicely and still has lots of display space. He is so good at making this stuff, and I am so lucky to have his help. Time to get back to sewing! 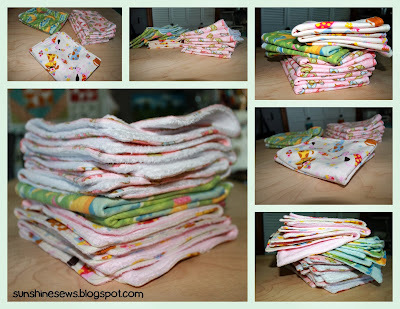 I washed some flannels and ultra cuddle fabrics and whipped up these baby burp cloths. I wasn't really sure what a nice size would be for these things so I used the measurements from Made by Rae's tutorial. The link to that tutorial is here. I made a bunch of these cute quilted baskets as teacher gifts for my granddaughter, Chloe. She has four teachers, but I made 6 baskets. I just never know if there will be that special someone who should get one of these so I figured a few extra wouldn't hurt. I made these using a tutorial over at Pink Penguin's blog. You can find the instructions here. It's easy to make and actually easier than what I did. I added the machine quilting over the blocks and the tutorial did not include that. I also fussy cut the fabric that makes the bottoms, so I had to make the bottom piece a little bigger so I could cut it in half then put it back together so that the directional fabric was facing up on both sides. I am not sure how we will fill them, but at least it's a start on the Christmas items for this year. Now that October is here, besides fall, pumpkins, colorful leaves and cool weather, it's time to think craft fairs. Pretty soon it will be time to sell some crafts so I think I need to start concentrating on making more. It's been in the back of my mind, but now it's time to get moving. I've had a stack of old blue jeans just waiting for something like this. I used a tutorial I found on threading my way's blog to complete these. The link for the tutorial can be found here. These baskets went together quickly and easily so I will be making more later this month. It was fun to pick out the lining fabric and I think I can come up with many more ideas for the insides of these. I hope I don't run out of old jeans.